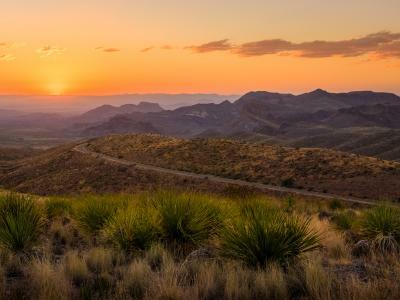 From mesquite-covered valleys to majestic red cliffs, Texas state parks in the Panhandle Plains region run the gamut of outdoor activities. Cast a fishing line, hike a canyon trail, stare at a star-soaked night sky, or watch the buffalo roam. 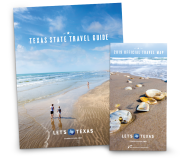 All that and much more awaits, so pack up the camping gear and experience both the tranquility and the thrills of outdoor living in the Lone Star State. You wake to the sounds of a gentle wind rustling the boughs of an ancient oak tree. Outside, light creeps across a vast, tree-lined lake. Coffee in hand, you plan your day—hiking, fishing, mountain biking? Or just sit for a while and watch a prehistoric-looking horny toad crawl up a rock to bask in the sun. With a scene like that, chances are you’re in a Texas state park. There are over 90 of them to choose from, offering a wide range of activities, camping options, and historic sites. However, some of the most intriguing, and some that are downright unique, are scattered across the Panhandle Plains region. For a camping trip last year, we decided to explore beyond our usual Hill Country or coastal destinations. It was time to boldly go where we hadn’t been before. That’s how the four of us ended up in the Texas Panhandle at Palo Duro Canyon State Park. Called the “Grand Canyon of Texas,” it’s the second largest in the country. “Breathtaking” was the only word for it. Standing on the rim of the canyon, we saw miles of red sandstone cliffs—layers from the Permian and Triassic periods clearly visible. The Lighthouse Rock is a prominent feature, and we immediately agreed to hike out the next day for an up-close photo op. Right then, however, it was late afternoon, so I suggested we find the cabin I’d called to reserve a few months before (thankfully, as the cabins are very popular). One of six built by the Civilian Conservation Corps (CCC) in the 1930s, our sturdy cabin was made of stone quarried from around the area. Inside, there were two bedrooms, one bathroom, a microwave, and a mini-fridge. We had dinner on the outside picnic table—hot dogs cooked on the grill—and watched the sun set. The night sky turned out with more and brighter stars than I’d ever seen, including the light-soaked path of the Milky Way. Next morning, we stopped at the Trading Post on the canyon floor to get trail snacks and water for our hike. A backpacker there told us about Caprock Canyons State Park, about 90 miles to the southeast. He said it was not quite as large, but stunning nonetheless, with the same rust-colored mesas. He’d hiked a good share of the 90 miles of trails and had caught his dinner—a trout—at the park’s Lake Theo. I learned that Caprock is also home to the state’s Official Bison Herd, which roams 700 acres of grasslands. Impressed as we’d been with Palo Duro Canyon, we later made subsequent trips to other notable parks in the Panhandle Plains region. 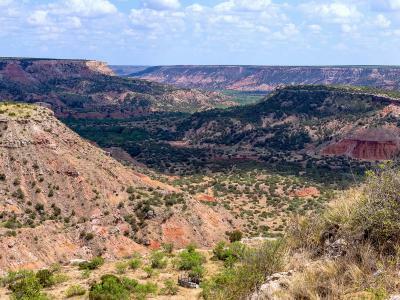 Copper Breaks, just south of the Oklahoma border, is an excellent spot to commune with nature, both on foot and on horseback. Hiking a trail through the backcountry, we saw mule deer, prairie dogs, some wild turkeys, and a turtle. That evening, we were met with an even more brilliant sky than we’d seen over Palo Duro and discovered that Copper Breaks has been designated an International Dark Sky Park. Two of the state parks in the region boast beautiful lakes—Lake Arrowhead and Possum Kingdom Lake. Lake Arrowhead is great for fishing, with a nine-lane boat ramp, a lighted fishing pier, and a floating dock. Scuba diving is popular at Possum Kingdom because of the lake’s astoundingly clear blue water. On this trip, our friends had brought their son, so we made a special stop at Fort Richardson. More than just a state park, it’s a history lesson as well. Back in 1867, a good number of settlers were migrating west through this area of Texas. To protect them from increasingly frequent Indian attacks by the Kiowa and Comanche, Fort Richardson was established with a post hospital, commissary, guardhouse, and officers’ quarters. All of those original buildings still exist, and to the delight of our 10-year-old travel partner, we got to tour them all, hearing stories about what life was like way back when. The park has hike-and-bike trails, too, and Quarry Lake for fishing and swimming. The “Limited Cabin” we’d reserved had all the necessities (minus linens and pillows, which we’d brought along) and a welcome extra: air-conditioning. Having learned more about the CCC-era state parks, I wanted to visit another I’d heard good things about, Abilene State Park. Rich in pecan, red oak, and cottonwood trees, the park has one of the most beautiful structures built by the Corps—a water tower with an observation deck and a swimming pool. Constructed of red brick with arches and a pavilion, it was solidly designed and, to this day, provides visitors with a great way to end a day of fishing at Buffalo Wallow Pond, hiking, and wildlife viewing. The other reason I wanted to go to Abilene State Park was for the yurts. A unique feature at this park, yurts were first designed by nomads in Central Asia. They are round, canvas-covered structures with floors, and the ones at the park, unlike the yurts of ancient times, had bunk beds, a pull-out sofa, and a microwave inside, with picnic tables, a fire ring, and a water spigot outside. We were cozy and comfy on that cool night and look forward to “yurting” again next year. While Caprock Canyons has the Official Bison Herd, the official longhorns live at Copper Breaks State Park, just outside the city of Quanah. Back in the 1930s, a wealthy Texas businessman was worried about dwindling populations of this Texas icon, so he spearheaded an effort to bring the herd to Copper Breaks. At periodic shows supervised by the park rangers, you can pet, feed, and even kiss a longhorn (by holding a pellet of food in your lips and allowing the animal to come and get it).